I saw a card on Pinterest that inspired the card I have to share today! I started the card with a Whip Cream Cardstock base. I stamped the Ink Splat ATS with River Stone Ink, twice, perpendicular to each other. I then splattered Silver and Bubble Gum Silk over the card. 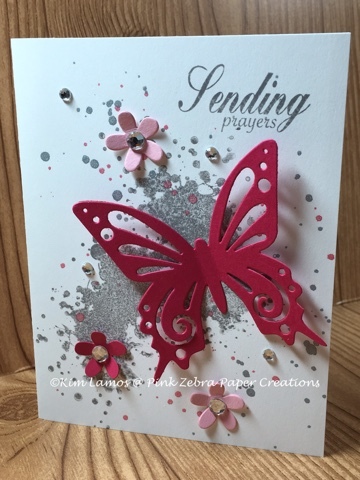 I then die cut the butterfly from the Artful Butterfly die and Sweet Berry Cardstock. I adhered the butterfly with white glue on the body part. I then stamped the "Sending Prayers" sentiment for the Lead Me set in River Stone Ink. Then die cut Spring Mini Blooms from Bubble Gum and Sweet Berry Cardstock. I adhered them to the card with white glue. I added the rhinestones to the flowers and a few to the card base. Enjoy!